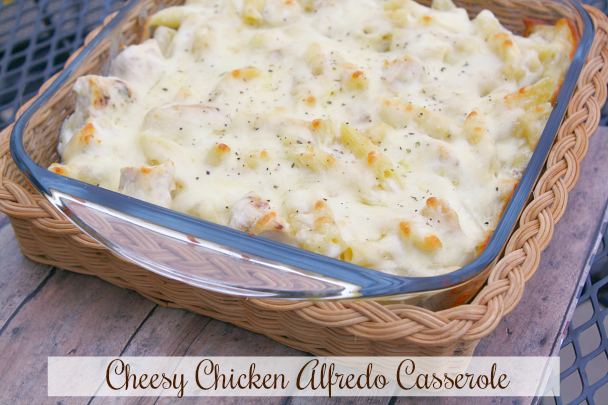 A Creamy Dreamy chicken and cheese casserole made with pasta, alfredo sauce and 5 different cheeses, mozzarella, provolone, romano, asiago and parmesan cheese. It's been a little over a week since I've posted a new recipe. Things have been a bit crazy at our house as well as attending an unexpected funeral. Sometimes life just takes over and there's nothing we can do about it. 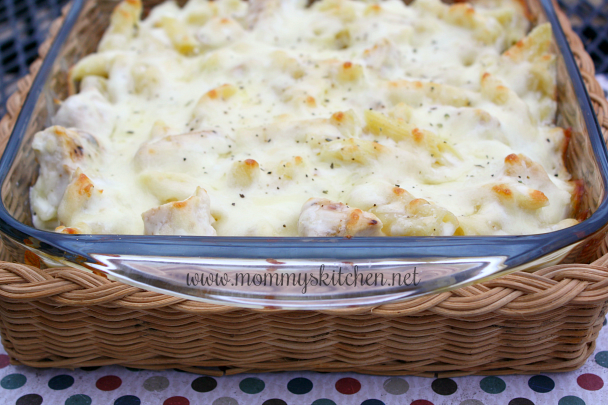 Today I want to share a recipe for this delicious Chicken Alfredo Casserole. My inspiration for this dish was really by accident. I had plans to make our favorite Fettuccine Alfredo, but was in a pinch for time, so I turned it into a casserole instead. This was such a simple recipe to make and it has a homemade alfredo sauce. 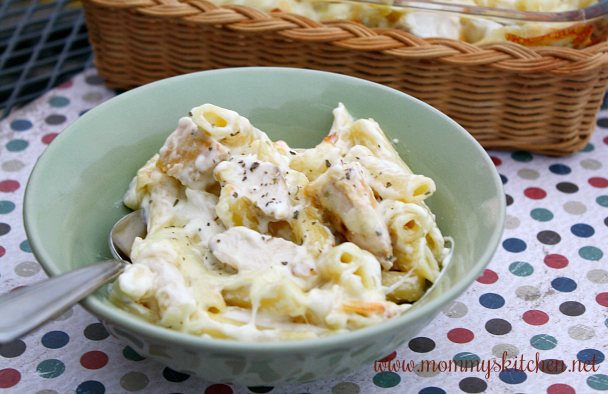 Most Chicken Alfredo Casseroles I've seen, call for jarred Alfredo sauce. I've used them in a pinch mostly for pizza, but when it comes to Alfredo sauce and pasta I prefer homemade. This casserole combines the flavors of five different cheeses, Mozzarella, Provolone, Romano, Asiago and Parmesan. The sauce was so creamy and cheesy and everyone loved this new twist on an old favorite. I know it looks like a lot of steps, but it really isn't. It just looks that way when you take photos and point out each step. First Cook the pasta according to package (al dente) then drain. While pasta is cooking, prepare the chicken (or use a store bought rotisserie chicken). In a 12-inch skillet or stove top grill heat 1 tablespoon olive oil. Split the chicken breasts, so they're not so thick. This will help them cook more evenly. Make a mixture of salt, pepper, thyme and poultry seasoning and rub it on both sides of the chicken breasts. Add the chicken breasts and sprinkle with salt and pepper. Cook and brown on both sides until chicken is cooked, browned and the juices run clear (about 10 minutes). Remove chicken to a plate, set aside and cool. Preheat oven to 350 degrees. While chicken is cooling start on the sauce. In a separate large skillet melt the butter; add the onion and garlic and cook for 1 - 2 minutes. Add the flour and mix using a wire whisk. Mix until bubbly and it starts to take on a bit of color. Add the half and half and milk; mix to combine. Bring mixture to a boil and then reduce hit to medium and simmer for about 5 minutes. Add 2/3 cup of cheese and blend using a wire whisk. Cook mixture an additional 5 minutes until the sauce starts to thicken up. The sauce will be thick enough when it coats the back of a spoon. Remove sauce from heat. Cut the chicken into bite size pieces and add to a large bowl. Add the cooked and drained pasta and the sauce last. Mix everything to combine. Spray a 8 x 8 inch square baking pan with non stick spray. Add the pasta mixture to the pan and sprinkle with an additional 1 cup of cheese. Sprinkle with pepper and bake for 30 minutes or until bubbly and golden brown. Garnish with a sprinkle of Italian seasoning. Cook pasta according to package directions for al dente then drain. While pasta is cooking, prepare the chicken or pull the rotisserie chicken off the bone. Using a 12-inch skillet or stove top grill heat 1 tablespoon olive oil. Split the chicken breasts, so they're not too thick. This will help them cook more evenly. Make a mixture of salt, pepper, thyme and poultry seasoning and rub it on both sides of the chicken breasts. Add the chicken breasts to the skillet. Cook on both sides until cooked, browned and the juices run clear (about 10 minutes). Remove chicken to a plate, set aside to cool. Preheat oven to 350 degrees. While chicken is cooling start on the sauce. In a separate large skillet melt the butter; add the onion and garlic and cook for 1 - 2 minutes. Add the flour and mix using a wire whisk. Mix until bubbly and starts to take on a bit of color. Add the half & half and milk; mix to combine. Bring mixture to a boil and then reduce hit to medium and simmer for about 5 minutes. Add 2/3 cup of cheese and blend using a wire whisk. Cook mixture an additional 5 minutes until the sauce starts to thicken up. The sauce is thick enough when it coats the back of a spoon. Remove sauce from heat. Cut the chicken into bite size pieces and add to a large bowl. Add the cooked and drained pasta and the sauce last. Mix everything to combine. Spray a 8 x 8 inch square baking pan with non stick spray. Add the pasta mixture to the pan and sprinkle with an additional 1 cup of cheese. Sprinkle with pepper and bake for 30 minutes or until bubbly and golden brown. Garnish with a sprinkle of Italian seasoning before serving. Serve with french bread and a vegetable to complete the meal. Cooks Note: My daughter dislikes onions so you can add more than the listed amount in the recipe. Thank you so much Marsha. I will keep looking up and this too shall pass. Thank you for the email. This looks SO good my friend. So good! This dish looks so good and seems really easy to make I will be making this really soon. Thanks for sharing. I just made this tonight and it was outstanding! A definite recipe that is staying with me. The sauce was just slightly bland to my taste, but nothing some added pepper didn't take care of. I also blackened my chicken and it added a lot of extra flavor. Thank you so much for this amazing recipe! My family loved it! This just got pinned! Oh it looks mouth-watering! Yum! I know my family will love this. Thank you for sharing. I'm visiting from http://artistic31mama.com and the Weekend Potluck party. I'm a new follower and glad to have found you. Have a great week! She like the chicken alfredo pasta that Pizza Hut makes and we all know homemade can beat that any day. This looks delicious! And easy! I'm pinning this so I can make it in the future! A regular Italian cheese blend will work as well. I made this tonight and it was delicious!!! I did make some changes to it though. I seasoned my chicken and instead of cooking the onions and garlic and butter in a different skillet, I cooked it in the same one as the chicken (after I had set the chicken aside on a plate). I also sprinkled some tony chachere's on top of the sauce before I poured it in with the chicken and pasta to add a little spice. It turned out very good! Has anyone tried to substitute light cream or fat free half-and-half for the heavy cream? How did it turn out using that? Can I make this in early morning and cook and just reheat in oven when were ready to eat? Is this similar to lasagna in that I can prepare the day before and reheat? If so, would you heat covered or uncovered? Oh my goodness! I just made this tonight. Didn't have heavy cream but used half n half and evaporated milk along with some cream cheese. SO GOOD. My severely picky kids LOVE IT! Thank you SO MUCH! I made your dish for my husband's birthday dinner and it blew my family's socks off. All plates where clean as a whistle! I'm sorry, I'm not clear about the 5 cheese blend with cream cheese. I did not see cream cheese in the recipe. Is it a flavored tub of cream cheese? This is just absolutely delicious!! Thank you so much for this amazing recipe. My husband devoured it and wanted me to make more! I suggest everyone tries this recipe at least once! I'm not seeing cream cheese in the list of ingredients either. Hi. . Mouth watering recipe. . The place dat I live in, we do not get all the varieties of cheese so will have to use the ready made sauce. . Hw many tablespoons of sauce for 3 people? ? Can I bake dis in my microwave on convection mode & on wat temp?? I would love to make this to take to my sick friend's family. Do you think I can make ahead, refrigerate, and then have her heat up at home? If you're taking it to a friend I would prepare and assemble the casserole, but bring it to your friend unbaked. Cream Cheese is not in the recipe. You can use Italian Cheese Blend or Kraft's Shredded 5 Cheese Italian Blend W/Cream Cheese. Half & Half is half cream and half milk. You can find in the refrigerated section where you purchase milk. Wanted to say I recently found this recipe and tried it this week after trying to find a good chicken Alfredo pasta dish for a long time. This sauce is really good my husband loves this dish but doesn't like the taste of just Parmesan cheese so this one is prefect with the Italian cheese mix. I have tried many recipes this is the first one that the sauce did not clump up turned out great. Thank you so much! It will be used by me often. @Katie there is no heavy cream in this recipe. It calls for half & half or fat free half & half. I snuck some broccoli in there and the kids still loved it! Great recipe! 2 - tablespoons flour. It is listed right under the butter in the recipe. can I double the recipe and use a 13 by 9 pan?